A problem may arise that POV-Ray version 3.7 uses a different sub-folder structure in the "C:\Program Files" directory on your computer than the precursor 3.6. 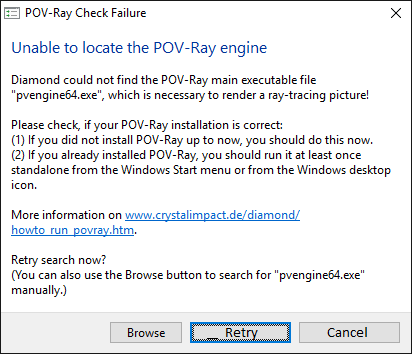 If this information is not available, Diamond tries to locate pvengine.exe (or pvengine64.exe on 64-bit Windows) in the "C:\Program Files\..." folder. The search for the POV-Ray engine fails, if neither the program POV-Ray has been executed at least one on your Windows PC and it has been installed in a folder other than the default folder. 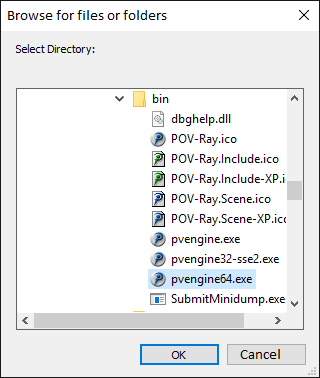 The easiest way is to execute POV-Ray at least once from the Windows desktop (usually there should be a "POV-Ray v3.6" or "POV-Ray v3.7" icon on the desktop) or from the Windows Start menu, so that pvengine.exe or pvengine64.exe, rsp., can write the path to its executable into the Windows Registry (and Diamond can locate it later from there when you call a POV-Ray command). When you confirm with OK, Diamond stores the path to the POV-Ray engine in its Windows Registry section for subsequent calls of POV-Ray commands. Page last modified March 14, 2019. Copyright © 1997-2019 Crystal Impact GbR. All rights reserved.